Automatic Eagle Beak Drum Lifters. If you have a large stock of liquids that you keep in drums, then having the means to store them neatly and compactly is essential. Perhaps the most important piece of drum handling & drum lifting equipment that is required in an environment where drums need to be placed on top of each other for storage is a drum stacker. This clever tool is designed to make lifting drums on top of one another a simple task. Drum handlers can lift a standard 55 gallon drum weighing up to 800lb to a height of 96 inches (8 feet), meaning that you can stack drums 3 high in order to reduce the floor space required by two thirds. The stacker is also useful as a crane for loading drums onto the back of a truck if needed, making it a very versatile piece of material handling equipment. Whether you are using the drum for waste storage or as a supply of material for manufacturing, being able to move it around is important so that it can be used by more than one person at a time. A cost effective way of being able to move a drum is with a simple drum dolly. These lightweight but hard wearing drum carts fit around the bottom of the drum and use polyurethane casters in order to ensure smooth movement across the floor. If your workplace uses 55 gallon oil drums as a source for liquids such as lubricant or paint, then getting the contents out is important, and the best piece of drum handling equipment for this task is a drum pump and tap. Slotting directly into the top of the drum, the tap uses a small electronic drum pump to get the contents of the drum out into more manageable containers. Without having to cut open the top of the drum completely or use a messy siphon, you can reduce the amount of wastage that you would otherwise incur, and save money thanks to this. Disposing of waste within EPA guidelines can be an expensive business, but by reducing the volume of waste produced, costs can be minimized. With a hydraulically powered drum crusher, a standard 55 gallon oil drum can be crushed into a 6” high disk ready for disposal. The power offered by this unique piece of drum handling equipment is enormous, and it is controlled with a single touch mechanism that is reliable and fast in action. By reducing the amount of storage space required, and presenting a much smaller amount of recycling waste by volume, efficiency is improved enormously. Drum lifts are designed to perform many different and very specific, operations, such as loading, unloading, racking, tilting, and pouring. 55 Gallon drum carts are the safest and most efficient tool to use in the retrieving, rotating, transporting, and tipping of drums. Drum cones enable to you to control the flow of dry materials you are dispensing from your drum. They fit over the top of the drum, replacing the drum lid and turning the entire drum itself into a precise pouring instrument. The major advantage of a 55 gallon drum heater that has been specially designed to heat up materials in their containers, is that the system is easy to control, and provides the liquid that you need consistently for as long as the heater is in use. Most oil drum heaters that are available for industrial use are designed to be powered by a mains supply of electricity so that they provide heat without a naked flame. 5 Gallon Pail Heaters. One of the main advantages of the latest generation of 5 gallon pail heaters is that they have been designed to heat the bucket from the sides rather than the bottom. Recycling your 55 Gallon Drums Steel Drum Compactors. The latest steel drum compactors are high powered and are excellent for reducing the amount of storage space required for waste, and reduce the costs of disposal too. Barrel Heaters. A normal barrel heater clamps around the outside of a standard 55 gallon drum, and a set of heating elements inside the unit provide a source of heat that can be controlled. Drum Racks. With high quality drum racks as part of your storage and transport plans, you can be sure that you are taking all the necessary steps to keep equipment and materials safe from harm. Drum Dispensers. A drum dispenser is a very specific piece of equipment that is used to assist in draining liquid from a standard drum. 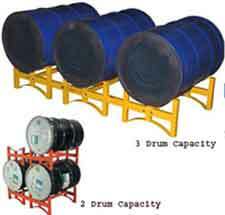 Plastic Drum Pallets & Drum Handling Equipment. It is now possible to buy special drum pallets that can support the extreme weight of fully laden drums containing liquid or powder. Oil Drum Storage Racks. One of the main advantages of using oil drums for storing liquids is that their size makes them a great repository. A 55 gallon drum storage rack is modular solution to your material handling needs. The units each hold 3 standard drums, and allow for the stacking of one unit on top of another to allow the total storage area to grow with your business while making the best possible use of available space. A 55 gallon barrel rack will be holding some extremely heavy contents, and it is essential that it is able to fully support the load that you are putting on it. It is also commonly the case that liquids will need to be moved from even larger receptacles into the 55 gallon drums for storage, and under these circumstances too, transfer pumps are required to ensure a smooth and easy flow that will minimize wastage. One of the most cost effective drum lifts available is the forklift mounted Eagle Beak drum lifter. The anatomy of a barrel pump is fairly straightforward. Typically, the unit fastens on to the opening at the top of the drum, screwing into place for added stability. A drum hand truck has been designed to make moving heavy drums from one place to another a quick and easy process. Electric pail pumps are available, and these provide an easily manageable flow of liquid at the push of a button. Drum carts, handlers and carriers are designed to be as simple as possible, with no unnecessary frills added to the design, and a number of slightly different models available. Using proper fork lift mounted drum handlers; you will find it much easier to carry full 55 gallon drums from one place to another without the various risks that are normally present in such operations. There are a number of different designs of 55 gallon drum dolly available, and all of them work in exactly the same way. Heaters are ideal for heating materials that require sensitive temperature control. These heaters aye designed to accomodate a metal fifty-five gallon drum on the supplied drum dolly. 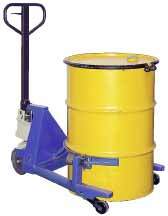 For quick and simple movement of standard plastic drums around the workplace, a drum caddy is the perfect solution. Drum Moving. Which ever option you choose for your drum storage solution, using the proper drum movers to get drums into their final position is essential if you are to avoid doing damage to systems or causing accidental spillages. One of the first things to consider when choosing a 55 gallon drum pump is what kind of liquid you need to dispense.